Last Friday in our monthly newsletter we announced the release of the first in our series Cycling the Silk Route – a 9-part YouTube series. During each of the next 8 months, we will be releasing one episode. The best way to make sure you don’t miss it is to sign up to our monthly newsletter where the official release happens each month. The first episode covers the Great Wall section of this 4 1/2 month and 12,280 km long trans-Asia cycling expedition. The video follows the 2016 tour riders and their adventures as they embark on their journey at iconic lakeside Summer Palace in Beijing and approach the Great Wall itself – a series of fortifications along China’s northern frontier that was begun in the 7th century BC to protect against raids and invasions. Then it’s across the windblown Gobi Desert – home to Bactrian camels – and on to the Mongolia’s capital Ulan Bator, meaning “Red Hero” which today serves as the cultural, industrial and financial heart of this ancient and imposing land. 1 comments for "Cycling the Silk Route: Part 1 of our 9-Part YouTube Series"
Please send me emails when new episodes are available. 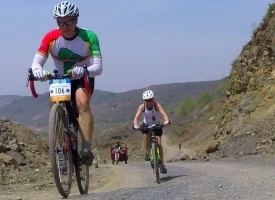 Leave a comment for "Cycling the Silk Route: Part 1 of our 9-Part YouTube Series" by visiting the original post on our TDA Global Cycling blog.